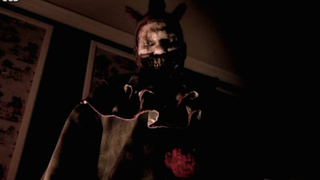 American Horror Story's writers and creators excel at exploiting our deepest pathologies and paranoias, so it was only a matter of time until they debuted that oh-so-ordinary childhood terror: the scary clown. And Lana del Rey! Veering from the freakishly primary-color scary clowns of John Wayne Gacy and his scary-clown ilk, in a new AHS: Freak Show trailer, we see this version of scary clown is characteristically darker, more sinister. Our leftover kid-nightmares are mostly shed for a depiction of a much realer type of fear, which is that of a maybe-real man, distorted and disturbed enough to break in and haunt (or kill) us while we sleep. Perhaps this clown-actor is moonlighting on Stalker with AHS alumnus Dylan McDermott? Perhaps not, but his character's name is Twisty, which appropriately sounds like demented ice cream. This installment of the show looks typically stylish and eerie, especially with the inclusion of a two-headed Sarah Paulson and a three-breasted Angela Bassett (on trend!). The burning question, of course, is whether it will reach the feminist heights of Coven, which had one of the most badass ensemble casts of women on television last year, and of course just reaffirmed everybody's love of witches. The show premieres on October 15, so you have two weeks to get your little Freak Show fantasy draft going. Yesterday, AHS creator Ryan Murphy tweeted that at some point during the season, Jessica Lange will cover Lana del Rey. That makes sense considering this part of the clip, which makes Lange's character, the German expatriate Elsa Mars, as a very torchy looking Dietrich type. Also, Elsa Mars is as plausible a stage name as Lana del Rey. IRL duet?